WE USE ONLY THE FINEST MATERIALS. YOUR FRAMED TREASURE WILL BE ENJOYED FOR GENERATIONS! Yellowing, cracking, fading . . . you’ve seen it. Time and air are not friendly to our efforts to preserve our cherished memories. Every piece of material that we use, from the mat board to the glass to the frame, is engineered to resist the ravages of time and oxidation. Learn more in detail about our materials below. 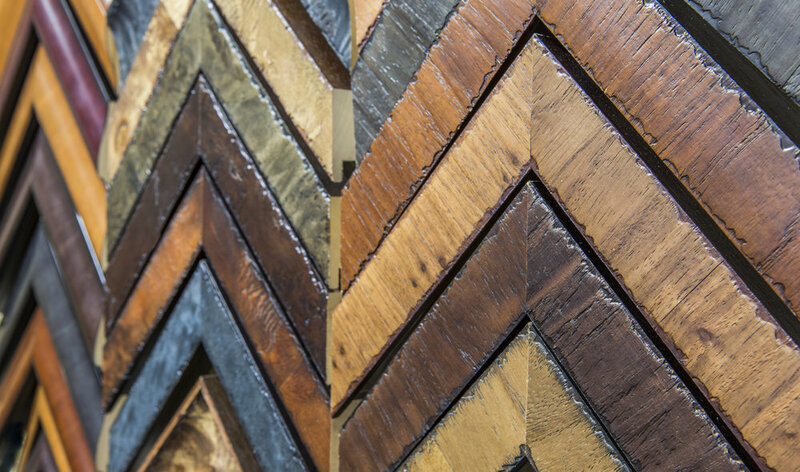 Moulding choices come in a variety of shades and widths. 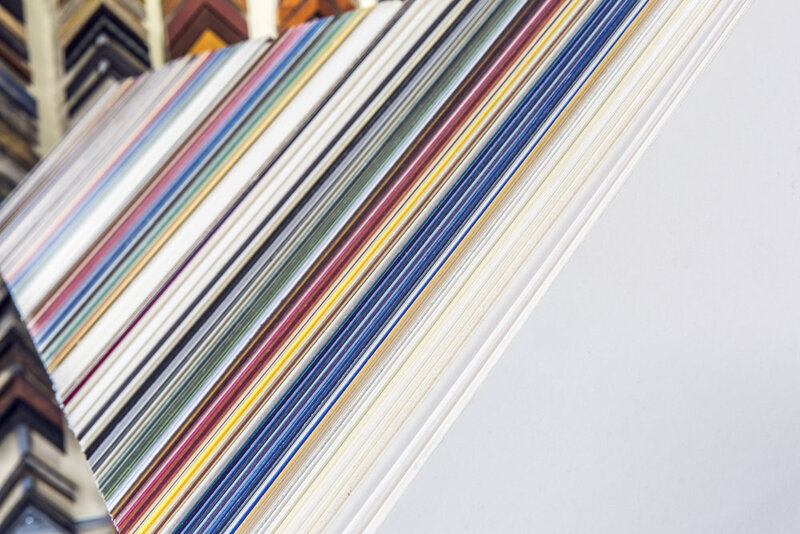 We offer hundreds of different styles of frame mouldings. Our frames are classic without being trendy, so the investment you make in framing today will be cherished for years to come. Did you know we use the same mat boards trusted by the Library of Congress to protect our national treasures? We use mat boards with Artcare technology: state-of-the-art pH neutral mats infused with patented micro-chambers that trap and neutralize acidic gases and pollutants that cause deterioration, yellowing, and fading. Your photograph or artwork will stay young forever, delighting your family for generations. You have the choice of a wide spectrum of colors, textures, and finishes. The diversity of our mats coordinates with all of the popular interior design styles and personal styles. We can assist you with the options, or you can pick it all yourself. We also offer Custom Laser Work that can Embellish the mat board with a laser cut logo, name, or other decorative artwork. Check out examples of laser cut mat embellishment on our gallery page. When it comes to the right kind of glass to cover your artwork, quality matters. We don’t even carry plain glass for the simple reason that it doesn’t protect your treasures. Why go to all the trouble and expense of framing, only to watch the memory fade over time? (We don’t think so, either.) We offer two types: Conservation Glass® and Museum Glass®. 1) Conservation Clear® framing glass effectively blocks up to 99% of UV light rays. Long-term exposure to UV light rays (yes, even indoors) contributes to deterioration and fading. Conservation Clear glass effectively blocks those UV light rays to protect against fading and help keep keepsakes preserved for years. 2) Anti-Reflective Museum Glass® offers a premium anti-reflection framing glass. Just like Conservation Clear, Museum Glass blocks 99% of all UV rays, but is also is glazed to give it a nearly invisible finish. The difference is truly remarkable, and if your budget allows, this Museum Glass deeply enhances your enjoyment of your framed artwork. If you have any question about materials we use please fill out the form and we'll get right back to you.